A cemetery in Australia will soon be offering people the chance to be buried feet first. A company in Victoria state has been given permission to open a vertical cemetery, where bodies are buried standing up and without coffins. It is an environmentally-friendly and cheaper option, says Tony Dupleix, director of the firm Palacom. Once stable, the site - in Derrinallum, 180 km (110 miles) from Melbourne - would be turned into grazing land. "When you die, you are returned to the earth with a minimum of fuss and with no paraphernalia that would affect the environment," said Mr Dupleix. "You are not burning 90kg of gas in a crematorium and there's no ongoing maintenance costs." The vertical cemetery - believed to be the first in Australia - has been approved by Victoria's state planning officials. 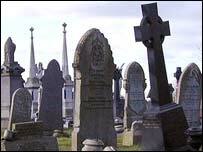 The bodies will be transported from the mortuary in Melbourne in batches of up to 15 to reduce costs, said Mr Dupleix. Each body will be encased in a body bag and buried in an individual three-metre deep (10 ft) hole. Burials will cost around A$1,000 (US$780). Anne Jamieson, of the Darlington Cemetery Trust, which will manage the cemetery, said it would prove an attractive option for some. "If you are interested in the environment, it's beautiful land on the Western District plains facing Mount Elephant," she said. "Some people will think it's great but other people might prefer a traditional burial."